If you are thrilled with your horse in every way except for his aggression or focus issues around the ladies, then castration procedures may be something you want to discuss seriously with your veterinarian. Many horse owners choose to geld their horses to improve concentration, and get rid of unnecessary frustration and distraction. What is Gelding a Horse? "Gelding" a horse is the same as castrating him, by a procedure called an orchiectomy. This surgical procedure entails the extraction of the testicles, which are the male sexual organs that create testosterone and sperm. Once a veterinarian removes the testicles, then a horse's body ceases production of testosterone, which is the hormone that contributes to undesirable, hormonally-influenced stallion behavior. Gelding a horse, similarly to spaying or neutering a cat or dog, often helps calm him down and improve his overall temperament. "Stallion" is a word that describes a physically mature male horse. Part of acting like a stallion is displaying hormonally charged behaviors, which include physical aggression with peers and with human beings, loud and piercing vocalizations, efforts to mount female horses, masturbation and even occasionally self-mutilation due to anxiety. Castrated horses, which are referred to as "geldings," generally are easier to manage than stallions due to the absence of these behaviors. It is acceptable to geld horses of all ages, according to Deirdre B. Biles of Bloodhorse.com. However, many veterinary experts note that early gelding may lead to optimal results. If a colt has not even reached one full year in age, the procedure may prove to be more effective in the long run. If a veterinarian gelds a young colt, then he probably would not have had the time to take on some of the more unpleasant, sexually-fueled stallion traits. Older horses already may exhibit some of these behaviors, and once they begin, they aren't always very easy to eliminate. Gelding an older horse certainly will prevent impregnation of female horses, but it may not prevent fighting behaviors or the desire to mount, for instance. All horses are different, and no two are exactly the same. 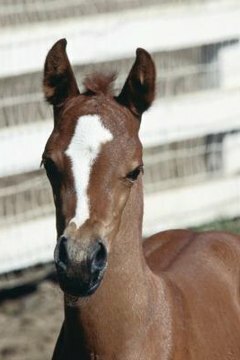 Speak to your veterinarian regarding your specific colt or horse, and take his overall health into consideration. The range for castration in horses is immense. Some have the procedure done merely days after entering the world. On the other hand, some male horses become geldings when they're past 20 years old, although this is very rare and usually only done for health reasons. For the most part, gelding is performed when young colts are around 1 year old, or slightly less than that. Always consult an experienced veterinarian regarding the health and treatment of your pet.